Mercian are undertaking a long-term archaeological research project of a site in the village of Bainbridge in North Yorkshire. Bainbridge is situated in the beautiful Wensleydale Valley, set in the iconic Yorkshire Dales National Park. 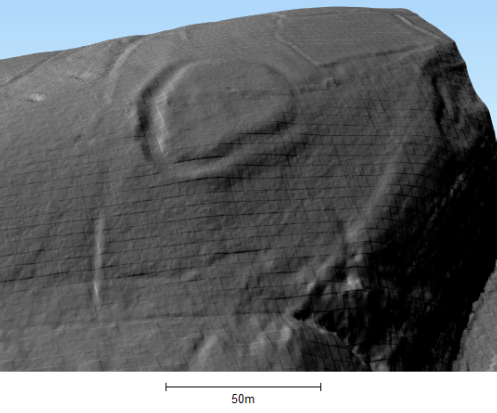 The Bainbridge Archaeology Project focuses on a multi-phase site surrounding a very rare ‘Slight Univallate Hillfort’ dating from the Late Bronze Age to the Early Iron Age. Bainbridge was formerly the administrative centre of the medieval Forest of Wensleydale, and the magnificent Bolton Castle near Leyburn dominates the valley to the east. The area is famous not only for its beautiful landscape, but also it world famous cheese, and as the backdrop to the Television series ‘All Creatures Great and Small’. The Bainbrige Slight Univalate Hillfort, Late Bronze age to Iron Age, viewed from the South. LiDAR Composite DTM - 1m data hillshade image created in GIS. Contains public sector information licensed under the Open Government Licence v3.0. The Bainbrige Slight Univalate Hillfort, Late Bronze age to Iron Age, viewed from the South-southwest. LiDAR Composite DTM - 1m data hillshade image created in GIS. Contains public sector information licensed under the Open Government Licence v3.0. Due to the very rare status of Slight Univallate Hillforts, and particularly one located so far north, the Bainbridge site is protected as a Scheduled Monument. “Slight univallate hillforts are defined as enclosures of various shapes, generally between 1ha and 10ha in size, situated on or close to hilltops and defined by a single line of earthworks, the scale of which is relatively small. They date to between the Late Bronze Age and Early Iron Age (eighth - fifth centuries BC), the majority being used for 150 to 200 years prior to their abandonment or reconstruction. Slight univallate hillforts have generally been interpreted as stock enclosures, redistribution centres, places of refuge and permanent settlements. The earthworks generally include a rampart, narrow level berm, external ditch and counterscarp bank, while access to the interior is usually provided by two entrances comprising either simple gaps in the earthwork or an inturned rampart. Postholes revealed by excavation indicate the occasional presence of portal gateways while more elaborate features like overlapping ramparts and outworks are limited to only a few examples. Internal features included timber or stone round houses; large storage pits and hearths; scattered postholes, stakeholes and gullies; and square or rectangular buildings supported by four to six posts, often represented by postholes, and interpreted as raised granaries. 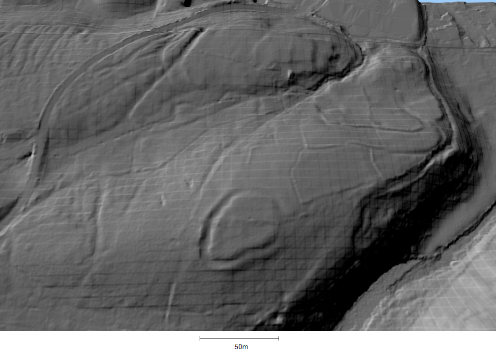 Slight univallate hillforts are rare with around 150 examples recorded nationally. Although on a national scale the number is low, in Devon they comprise one of the major classes of hillfort. In other areas where the distribution is relatively dense, for example, Wessex, Sussex, the Cotswolds and the Chilterns, hillforts belonging to a number of different classes occur within the same region. Examples are also recorded in eastern England, the Welsh Marches, central and southern England. In view of the rarity of slight univallate hillforts and their importance in understanding the transition between Bronze Age and Iron Age communities, all examples which survive comparatively well and have potential for the recovery of further archaeological remains are believed to be of national importance”. “This hillfort is situated on a natural spur above the River Bain. It is oval in plan, 41m in diameter overall and enclosed by a single ditch averaging 6m wide and 1m deep at its deepest point on the west edge. It becomes less distinct on its east side and near the field wall which bisects the site, where it is barely visible. An outer upcast bank is very distinct on the west side where it stands 1.2m above the base of the ditch. Much of this bank has been ploughed out on the north east and east sides and merges with the slope to the south and north. Excluded from the scheduling is the modern field wall which traverses the monument, although the ground beneath it is included”. The fields surrounding the hillfort are rich with archaeological remains including field boundaries, earthworks of building platforms, a possible Roman road, and many other elements waiting to be discovered and recorded. 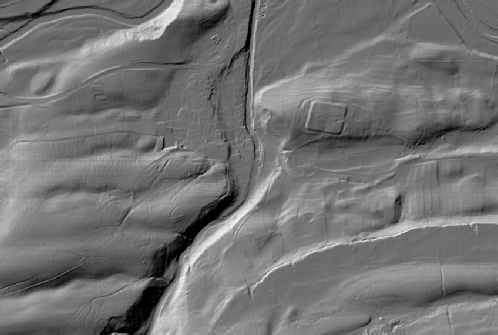 Bainbridge Univallate hillfort with the later Roman Fort situated on the hill to the northeast. LiDAR Composite DTM - 1m data hillshade image created in GIS. Contains public sector information licensed under the Open Government Licence v3.0. Fieldwork has begun at the site in 2018 with a topographic survey by Mercian, as well as LiDAR analysis and other desk-based historic map work and research. 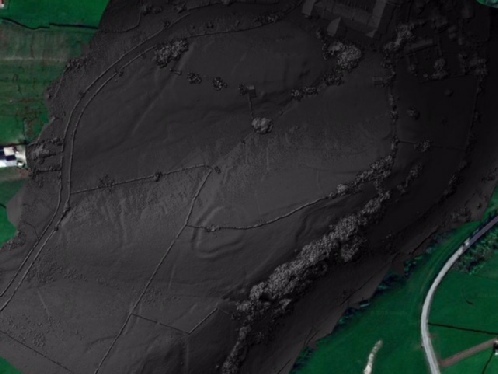 Alongside this a photogrammetric survey was very kindly undertaken in May 2018 by Tony Hunt of Yorkshire Archaeological Aerial Mapping ( http://www.yaamapping.co.uk/). Some of the results can be seen below. Thursday 22nd, Friday 23rd and Saturday 24th November 2018. £20 per day or £50 for all 3 days. This is a real hands-on practical learning experience where you will undertake the survey yourself of this important archaeological and historic site.